ABC had high hopes for GCB and Pan Am in the Sundays at 10pm timeslot but both were cancelled due to low ratings. Will it be a different story for this season’s entry, 666 Park Avenue? If you haven’t seen it, 666 Park Avenue follows a young man and woman (Dave Annable, Rachael Taylor) who’ve moved to the Big Apple from the Midwest. They end up managing The Drake, a prestigious residential hotel and feel like they’re living a dream — until they realize that every dream comes with a price. The cast includes the talents of Terry O’Quinn, Vanessa Williams, Robert Buckley, Mercedes Masöhn, Helena Mattsson, Samantha Logan, and Erik Palladino. Per the fast affiliate ratings from Nielsen, the series debut of 666 Park Avenue drew a 2.2 in the 18-49 demographic with 7.0 million total viewers. Compared to last fall’s premiere of Pan Am, the network was down by 29% in the demo (vs a 3.1 rating) and down by 37% in viewership (vs 11.06 million). While 666 Park Avenue isn’t a huge bomb out of the gate, these are pretty bad numbers. It’s highly unlikely that the show will live to see a second season. What do you think? Do you think 666 Park Avenue will go on to be a hit in the ratings or will it end up being cancelled like so many other shows? I liked it! But if people are told that it isn’t very likely to succeed, then it won’t! 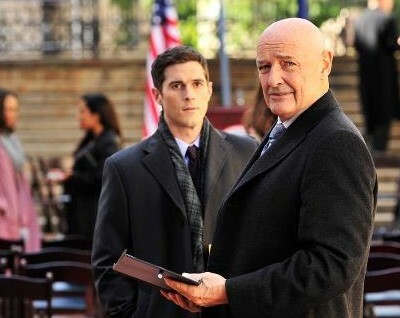 Terry O’Quinn is absolutely perfect for the part, his subtle, yet piercing stare is phenominal, as is his acting! Rachael Taylor is also the exact right person for her part! I think the show has extraordinary potential if it can just get the chance it deserves!